01182013_Becherer_IraqMedical010: Doctors of War: Casualties of War: Global News Portfolio: New Orleans based Photojournalist covering the Deep South and beyond. 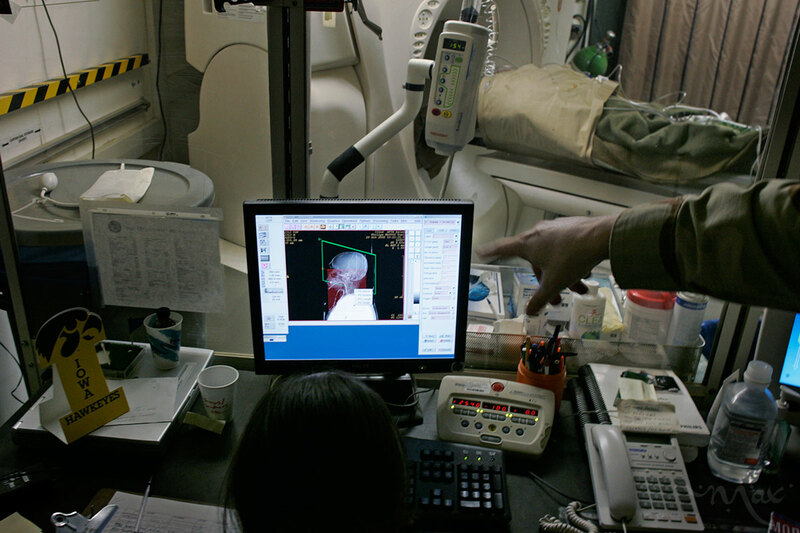 CT scan technician, Staff Sergeant Kelly Dewey, looks at the brain scan of Marlon Salcepalma through a CT scanner looking for internal bleeding after he received an RPG blast to the body at Balad Air Base, on October 30, 2005. Such modern technology so far forward on the battlefield is what helps keep the number of patients who die once they reach the hospital down to 4.2%, according to Colonel Elisha Powell.